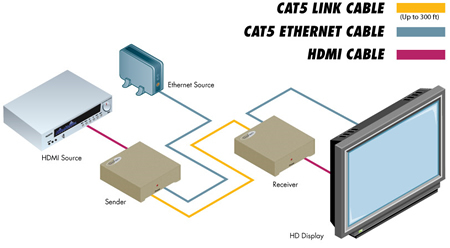 The Gefen EXT-HDMI1.3-CAT5-ELR extends HDMI 1.3 and Ethernet up to 330 feet over one CAT-5 cable. The Extender for HDMI 1.3 over CAT5 with Ethernet extends your Hi-Def display with multi-channel digital audio at resolutions of up to 1080p60 up to 330 feet (100 meters) away from your HDMI or DVI-D source using one CAT-5 cable. It supports DVI-D when used with an HDMI to DVI Adapter, providing greater flexibility and options when integrating several home theater components. This product also extends Ethernet and provides an IR back channel to control AV sources using the same CAT-5 cable extension. With the built-in IR Blaster, simply point the IR remote(s) at the display to control the Hi-Def sources as if they were located in the same room as the display. The Extender for HDMI 1.3 over CAT5 with Ethernet sender unit sits next to your set-top box or DVD player source. Cables supplied with the Extender connect your HDMI source to the sender unit. The Extender receiver unit sits next to your display - up to 330 feet away. The HDTV display plugs into the back of the Extender for HDMI 1.3 over CAT5 with Ethernet receiver unit. Only one CAT-5 cable connects the sender and the receiver units to each other. The Ethernet ports on both the sender and receiver are connected to standard network devices such as 100Base-T routers and hubs. Multi-channel digital audio is embedded into the HDMI signal (Dolby True HD / DTS Master Audio). Note: The Extender for HDMI 1.3 over CAT5 with Ethernet is fully HDMI and HDCP compliant when both power supplies are used. Input Connector HDMI 19-pin Female type "A"
Power Consumption 5V DC @ 2A/10W max.